Ranke needs no introduction; for Lingard see Jones, John Lingard. Long term readers of this blog and of my own exchanges with two New Testament professors have experienced the pain and dismay of learning that among scholars of biblical studies there are those who have not heard of Ranke and who have further advertised their ignorance when attempting to criticise my own posts even though I have used his name for no reason other than to point to his uncontroversial contribution to modern historical research — that it must be grounded in (primary) source materials. Occasionally a work by a New Testament scholar will refer to the name in works for their peers but when they do so it will be with that introduction that is superfluous for other historians and/or they will, as likely as not, oversimplify his views or rely upon a popular mistranslation of what he wrote about the nature of history. Of course there are other aspects of Ranke’s methods that are long obsolete but one does even today regularly read his name for his lasting contribution to historical studies in works of historians addressing the nature of their craft. Not so in the works of New Testament historians, however. He is generally an unknown there. If a name needs no introduction we can assume that every historian worth her salt knows the person and their contributions to their discipline. Long term readers of this blog and of my own exchanges with two New Testament professors have experienced the pain and dismay of learning that among scholars of biblical studies who insist they are “historians” there are those who have not heard of Ranke. These biblical historians rely upon the relative meaning of primary sources. They have no choice. No “absolute” primary sources exist for the study of Christian origins. So what are they missing out on? What sorts of primary evidence lies (either directly or indirectly) at the base of most other historians’ works? Let’s continue with my take on Henige’s discussion. Even the idea of a “contemporary” source can be a fuzzy one. Both a high-brow national broadsheet and a local rag can publish a story on the same day. The two stories may be given very different emphases and be told in very different detail. What were the respective reporters’ sources? Were they eyewitnesses? Were they equally well placed to observe? How observant were they? How much did they recall and how much additional colour did their memories soon create? Henige tells us of three levels of (absolute) primary evidence: participant, eyewitness, hearsay. Henige here is speaking of sources closest to the events they describe but are not contemporaneous. Secondary sources are necessarily dependent upon other sources that may be lost to us. (Compare “relative” primary sources above.) Even if we accept Richard Bauckham’s case that the canonical gospels are directly dependent upon eyewitnesses they are still secondary sources in our context here. The argument from silence can never be completely foolproof, but in this instance it must be regarding as convincing. If nothing else, it hardly bears imagining that Las Casas (who was in Hispaniola in 1507) would have failed to mention an epidemic of smallpox in that year had it occurred; after all, he was not entirely averse to mentioning other catastrophes which had not occurred. 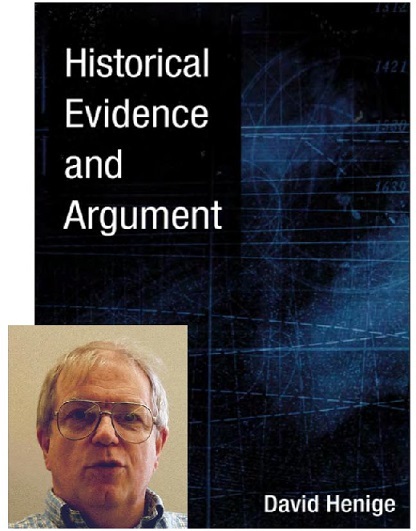 Henige understands the temptation historians face with the secondary evidence so cogently offers clear answers and explanations. At the same time he recognizes the circularity of such solutions when they are based entirely on secondary sources. I began by pointing out that the date of 1507 had recurred with increasing regularity and that it would prove a valuable and much-needed argument for the proponents of large numbers of Indians in Hispaniola and in other parts of the New World since, by their model, it would have provided an early and excellent mechanism for rapid depopulation and, better yet, a mechanism which would provide no opportunities for disconfirmation. Although the proponents of large populations have not yet pushed this particular argument very strenuously, the present discussion may have some value in precluding at least this part of the very circular, yet somehow persuasive, line of reasoning that characterizes that cause. . . . . It is easy enough to assert that the 1518-1519 epidemic was simply the first recorded one there [i.e. the first one to be officially documented] . . . but to do so merely begs the question in a particularly desperate way. 3. The bison population. When speaking of the bison population in North America for a long time historians “blindly followed an early estimate of 75 million or more” but research has shown the the number should be less than half of that figure. (Isenberg, Destruction of the Bison, 23-30). and reminds us that, while we might begin with the source nearest to the events described, we should certainly never end with it. The above line of reasoning would pull the rug from beneath the feet of the well-guarded traditional models of Christian origins. That does not mean similar models might justifiably replace the current ones, but the key word here is “justifiably”. 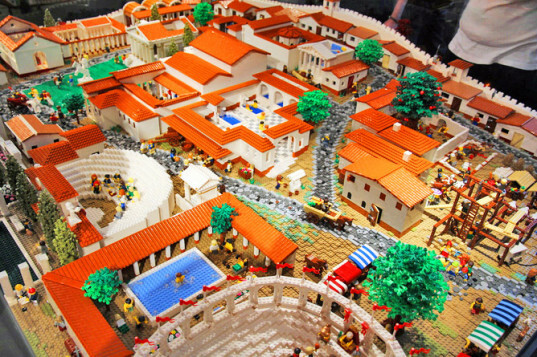 Ryan McNaught, aka The Brickman, was recently commissioned by the Nicholson Museum in Sydney, Australia to recreate the ancient city of Pompeii entirely from LEGO bricks! The exhibit, now on display in the museum, shows how Pompeii looked at the moment of destruction in A.D 79, how it looked when it was discovered in the 1700’s, and how it looks today. Pompeii illustrates the point. The true primary source is the excavated site itself. Eyewitness reports are necessarily relegated to a lesser status. Over time material is removed from the excavated site and reconstructions are erected there. So over time the excavated site of Pompeii can become less primary than accounts of it before the renovations began. Sources can thus change over time the way medieval churches evolved through successive generations to be extended and reshaped to become quite different from their original plan. To bring this back to our sources for earliest Christianity, in the same way texts (as well as oral accounts) can be regularly modified over time as they serve the “changing collective memory and self-identity of a community”. Critical scholars of the Bible have generally recognized that our canonical Gospels have emerged through such a process although it appears that a growing number of theologians are now questioning the extent to which this view holds weight. A source can be either primary or secondary depending on the use to which we put it. A secondary source can become a primary source when it is used to study the beliefs and culture of the time and society in which it was composed. Historians instinctively warm to evidence that purports to be eyewitness. How much more primary can a source be? Historians from Herodotus to the present have taken care to assure their readers that at least some part of their testimony was ocular. Some scholars regard Herodotus’s visit to Egypt as fictional, but this is hardly Herodotus’s fault. More than thirty times he assured his readers that he saw or heard what he wrote. (2005: 46). My precious copy that I’ve guarded since my undergad days. In 2.106 Herodotus mentions two rock reliefs in Asia Minor, which are still in existence; and what he says about them is obviously wrong on several points. The most important point is that he states quite incorrectly that the inscription runs across the shoulders. Furthermore, he describes the script, again quite incorrectly, as Egyptian hieroglyphics (in fact it is an example of the so-called Hittite hieroglyphics), a misstatement that cannot be explained away as a simple error, since to anyone who has seen the former once or twice they are completely unmistakable. Diodorus Siculus 1.10ff. : the account of Egypt, much of which is Herodotus in varied and extended form, is given in indirect speech as coming from the Egyptians themselves. Dio Chrysostom 11.37f. : an Egyptian priest tells the true story of the Trojan War, drawing on temple archives and (lost) stelae. Scriptores Historiae Augustae 19.4.1: certain it is that Maximinus ate forty pounds of meat a day; indeed according to Iunius Cordus it was as much as sixty. Ctesias is said by Photius bibl.72 to have presented most of what he recounted as directly experienced by him or else told him by the Persians. —idem ap. Aelian nat. an.4.21 (= frg.45d): he has seen the fabulous Indian beast called the martichoras in the Persian court. Apion FGrHist 616 F 5 (= Aulus Gellius 5.14; cf. Aelian nat. an.7.48): claim to have personally witnessed the lion recognising Androcles. Pausanias 9.28.2: Pausanias heard from a Phoenician how a snake killed a man with its breath. Seneca benef. 2.19.1: claim to have witnessed something like what Apion claimed to have witnessed (see above). Aulus Gellius frequently disguises the fruits of his reading in the form of a conversation with friends etc. Tacitus Germ.3: an altar built by Odysseus and other monuments with Greek inscriptions. Ammianus Marcellinus 19.9.9: a tribune mentioned by name counts 30,000 Persian dead after the battle, his task being facilitated by the fact that the Roman bodies decomposed rapidly, whereas the Persian ones simply dried up. And Richard Bauckham notwithstanding, the Gospels of Matthew and Mark don’t claim any eyewitness testimony while that of John attests eyewitness verification of some rather unusual and miraculous events. As for Luke, see posts on the prologue. Enough said. 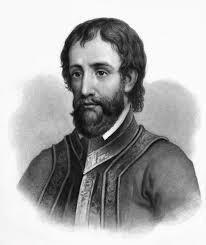 Example: Hernando de Soto’s expedition through the southeastern United States. Four volumes are known to exist; three appeared within a few years of the return of the survivors, the fourth sixty years later. The first three are largely matter-of-fact first person accounts; the fourth, longer than those three combined, is a rhetorically florid and detailed account purporting to be the remarkably detailed reminiscences of an unnamed participant. This fourth volume is rich in data about what the Indians and Spaniards “did, said and even thought”. True, there are now some feeble and formulaic cautions expressed by those haring after de Soto’s route. But once expressed, these are cast aside, and the hunters continue to use Garcilaso unflinchingly, just as if he had passed every test rather than failed them. These observations warn us that even among scholars who are without any faith allegiance we could expect the core outline of the Jesus narrative to be taken for granted as reflecting genuine historicity. Another illustration Henige gives is Caesar’s Gallic War. Beautiful: an ancient text written by an eyewitness. But wait, . . .
[T]he earliest surviving manuscripts date from the ninth to twelfth centuries, and the two major manuscript traditions differ in numerous ways. And so it goes for many works from antiquity that have been preserved by the monastic copyists. Using these sources uncritically forces historians to assume that nothing happened to alter them in the millennium or so between their first writing and our first glimpse of the text. As a working assumption this is unavoidable, but it can seldom bear the onus of serious scrutiny. Yet blood has been spilled over dogmatic beliefs in the authenticity of single words and phrases in the New Testament. The fact is that the self-witness of a text cannot be the arbiter of how we read any text. Several narratives stipulating participant status have recently come under fire as possible fabrications. A work professing to be a pre-Marco Polo account of southern China [=Jacopo d’Ancona, City of Light] recently appeared, but the ‘editor’ of the work has steadfastly refused to reveal the whereabouts of the manuscript on which it purports to be based, daring critics to disbelieve him, and they have obliged. Such discussions among non-biblical historians ought to put an end to accusations by too many New Testament scholars that raising radical questions about sources is not hyper or selective scepticism: some of us are merely attempting to treat the biblical texts the same way any historian ought to approach any primary or secondary source. There is much more to come yet. Henige even wades into instances of biblical scholarship himself. To be continued, etc…..
Fehling, D. 1989, Herodotus and His ‘Sources’, Francis Cairns, Leeds. Henige, D. 2005, Historical Evidence and Argument, University of Wisconsin Press, Madison. Posted on 2015-07-15 12:20:55 GMT+0000 by Neil Godfrey. This entry was posted in Historical Sources and tagged Henige: Historical Evidence and Argument, Historical Method, Historical Sources. Bookmark the permalink. This reminds me of the disclaimers by Paul’s modern biographers concerning the reliability of Acts of the Apostles for a source, who then go ahead and use Acts as if it is reliable. People also ignore Paul’s many warnings about himself. And about Cephas , or Peter. I think this sort of thing has been behind my own surprise (naive, I now realize) when attempting to engage a number of scholars on aspects of their arguments. I knew they at times expressed the problems with their sources but at other times were absolutely dogmatic over some point as if taking those problems seriously was suddenly “hyper-scepticism”. It appears to come down to whatever keeps you in good-standing with the club. In Victorian England it was called “keeping up appearances” in part. Maintaining the semblance of rectitude and solidarity in the ruling class and bourgeoisie. Peer pressure (not just 19th century Peers of the Realm, Bee) – career security and ideological fashion are the determinants. Don’t forget class interests and the mechanisms of oppression and subordination: never tell the people the truth. So you will always be superior to them in knowledge. Are you proposing a Marxist class analysis, an extension of it, or another variety? “The criterion of practice can never either confirm or refute any human idea completely” & “Our morality is subordinated to the class struggle”(Lenin). Seeing society in terms of class structure originated in Marxism in part. But over time it had come to be one of many widely-accepted tools in the Social Sciences. For that matter, Democracy itself was founded with the idea that the nobility and lords were working in their own interests, more than in the interest of the lower class; the People. To some extent furthermore, class structure persists. Even after the collapse of feudalism, the nobility and the clergy often continued to cooperate however; and were finally united in say the British House of Lords. Which includes lords or peers; and clergy. And the Queen and the royals continue to have some influence in BG. IN American class structure, it’s “the suits” vs. everyone else. By the way though, it’s not just class antagonisms that motivate Historicists to ignore evidence against their sources, and to jump to the conclusion that Jesus was a real actual historical person. The really main factors are first of all, 1) faith bias. Most religious scholars were trained from infancy to, in matters of religion, ignore even what your “eyes” tell you, and to follow on blind trust or “faith,” what holy men and churches tell you. So when the evidence for historical Jesus runs out, the old trust in “faith” simply reasserts itself. Even in Christian “scholars.” When the facts run out, they are trained systematically to take a “leap of faith” to their preferred dogmatic conclusion. Also there is the fact that 2) zealous believers still play a major economic – and intimidating – part, even in modern culture. At one time, if you opposed their beliefs, you could be killed formally or informally, for “heresy” and “blasphemy.” To this day, zealotry continues to make people highly emotional often, and angry – and dangerous at times – if you oppose their religious beliefs. Especially in Muslim countries, but to some extent, even in America. This means that there is to this very day, some considerable social pressure even on religious academics to conform at least to some degree, to conventional religious believers. At least to the extent of saying, as a minimum, that Jesus exists at least in some kind of minimal reality. The essence of the Marxist and Marxist-Leninist class analysis is the relationship of people to the ownership of the means of production. There are various Marxist and neo-Marxist “explanations” of religion(s). Karl Kautsky’s “Foundations of Christianity” is worth reading, however wrong-headed. Rich people can be expected to have more power than poor people, and to wish to hang to it. In large sections of the western academy and publishing there are dominant neo-Marxist ideologies of “race, gender and class” whose tenured gurus do not like to be challenged. Heretics are denounced and expelled from office. There are good people and bad ones, in every line of work. Fehling might be too critical of classic historians though. Current forensic CSI science tells us that bodies tend to begin to rot in the intestines, according to the food the victims ate. So well fed or bad meat eating Romans, might rot faster than Persians on a different diet.